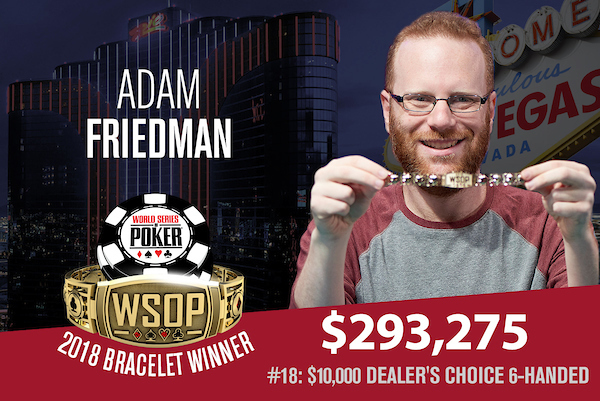 No crying here - Adam Friedman now has two WSOP bracelets (WSOP photo). Sunday was another extremely busy day at the 2018 World Series of Poker with three more players walking away with a shiny, new WSOP bracelet. Those winners included a player grabbing his second career bracelet, a WPT500 champion and a European Poker Tour winner. But while those events were playing down to a winner, some of the best poker players in the world were putting up $10,000 to play one of their favorite events, the No Limit Deuce to Seven Championship. Adam Friedman has a special place in WSOP history thanks to his emotional reaction to being eliminated from the 2005 WSOP Main Event. Yes, Friedman is the “crying guy” – but he’s worked hard to change public perception of him and on Sunday took another step in that direction by winning his second career bracelet. Friedman beat out a final table that included Marco Johnson, David ‘ODB’ Baker, Chris Klodnicki, Andrey Makarov and Stuart Rutter to win the $10,000 Dealers Choice Championship event. Winning this event, against a tough final table, holds special value for Friedman. The event allows players to pick from 20 different game variants throughout the tournament. Friedman believes that other players make mistakes when picking their games and haven’t put enough thought into the deeper strategic impact involved. Friedman’s first bracelet came in the 2012 $5,000 Seven Card Stud 8 or better event. Craig Varnell has had a few close calls in his WSOP career. A third-place finish from 2015 and a seventh-place finish in 2018. He finished the $565 Pot Limit Omaha event on Sunday night on top, outlasting a field of 2,419 players to win $181,790. “It felt good to finally close one out,” Varnell said. “I almost didn’t play this event. But when I did, and I got a stack, I had a big advantage over the other players. Before Sunday, Varnell was probably best known for winning the WPT500 in 2015. Seth Zimmerman finished second for $112,347. 2010 WSOP Main Event champion Jonathan Duhamel finished sixth for $33,477. Other big names to finish in the money included Ryan Laplante (20th – $5,830), Vivian Saliba (54th – $3,495), Ludovic Geilich (58th – $3,304), Dutch Boyd (79th – $2,397) and James Obst (99th – $2,019). When the final table of the $1,500 Six Max NLHE event started, four of the six players were previous WSOP bracelet winners. That didn’t seem to matter to the only two players without one though. Ognyan Dimov and Antonio Barbato outlasted all four bracelet winners to get heads-up before Dimov finished Barbato off to win his first bracelet. “You don’t expect to not have better players at the final table. You expect to have bracelet winners,” said Dimov. The Bulgarian is no slouch though. He won the EPT Deauville Main Event in 2015 and now has $1.44 million in live tournament earnings. Barbato ended up with $233,992 to console himself for his runner-up finish. Nick Schulman finished third for $163,785 and his second cash of the 2018 WSOP. Ryan D’Angelo and Joey Weissman finished fourth and fifth respectively while Yue Du, who won the $5,000 No Limit Hold’em event in 2016, finished sixth. Shawn Buchanan has become a mainstay on the “Best Players Without a WSOP Bracelet” list. He’s finished second three times and has made seven final tables. Thanks to a strong Day 3 in the $5,000 Big Blind Antes Event, Buchanan has a chance at getting off that list. Buchanan finished Day 3 with 2,580,000 chips, good enough for the chip lead over a final table that includes David Peters, Eric Blair and Jake Schindler. Buchanan started Day 3 sitting fifth in chips with 24 players remaining. Included in the 18 players that busted on Sunday were Kristen Bicknell, Stephen Chidwick, Michael Gagliano, Jan Christoph Von Halle, Seth Davies and Chris Bolek, who actually started the day on top. Action resumes at Noon PT. Italy’s Andrea Buonocore finished Day 1B of the $1,500 Millionaire Maker with 209,900, good enough for the biggest overall stack heading into Day 2 on Monday. Buonocore was one of 4,315 entries on Day 1B, pushing the total field size to 7,361 – exactly 400 entries less than the 2017 field. Former #1 PocketFiver Sorel Mizzi bagged a top 10 stack on Day 1B, finishing with 158,300. He will be one of 1,105 players returning to action on Monday. Those players – roughly half of them – will get some good news when they unbag Monday afternoon. Thanks to double elimination at the end of Day 1B, all remaining players are now in the money. The structure of the event, which sees Day 1A and 1B each play down to 15% of the field rather than a set number of levels, left some players extremely frustrated. Hey @WSOP you really need better guidelines for how to handle day1 of this millymaker. 1b playing over an hour longer is really unbalanced for multiple reasons. Maybe implement the play til money for every other $1500 and below that only have 1 day 1. This is really simple. Some of the more well-known players who will be in action on Monday include Jared Jaffee, James Dempsey, Anthony Spinella, JC Tran, Blair Hinkle, Tuan Le, Faraz Jaka, Qui Nguyen, Taylor Paur and Anton Wigg. Nicholas Seiken has just $72,692 in career tournament earnings but finished Day 2 of the $1,500 Eight-Game Mix event with the chip lead. If he hopes to outlast the remaining 15 players to win his first career bracelet, he’d be best served to not look up the lifetime earnings of some of his opponents. David Bach, John Racener, Anthony Zinno, Daniel Negreanu, Robert Williamson III and Mike Matusow have a combined 16 career bracelets and all still have a shot at adding to their total. Seiken bagged up 360,000 as one of the 16 survivors from the 184 players that started Day 2. Philip Long is right behind him with 357,000. Day 3 sees the final 16 players play down to a winner when action resumes at 2 pm PT. Just 85 players ponied up the $10,000 to play the $10,000 No Limit Deuce to Seven Championship event in one of the toughest fields of the year. Topping Day 1 was Galen Hall with Benny Glaser and Timothy McDermott right behind him. Just 38 players made it through Day 1 including Stephen Chidwick, Dario Sammartino, Scott Seiver, John Hennigan, Paul Volpe, Mike Gorodinsky, Nick Schulman, Billy Baxter, Erik Seidel and defending champion John Monnette. Action resumes Monday at 2 pm PT.